A journey through the horror films of Ramsay brothers. Disclaimer: The facts are taken from the journal "Taste, Taboo, Trash: The Story of Ramsay Brothers" by Kartik Nair. I personally declare that the journal is only used as a reference & no intentions copying the content for any benefits, it's only to spread the knowledge regarding the working ways of Ramsay brothers. Ramsay brothers heavily inspired by the western films, especially the ones made by Hammer production - Dracula series, Mummy series etc... decided to venture into production of Horror films, a genre which was left untapped by the Bollywood except for few horror films which became box office successes in 1950's & 1960's. 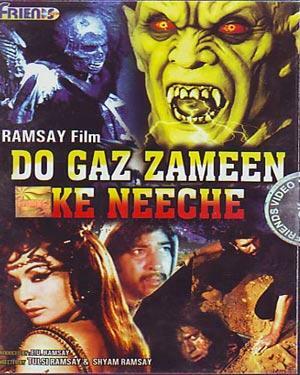 In 1972, Ramsay brothers decided to make their first horror film, Do Gaz Zameen Ke Neeche starring Imtiaz Khan (brother of Amjad Khan) & Shobhana. Do Gaz Zameen Ke Neeche was a runaway big hit, made in a budget of 6-7 lakhs got the attention of the audience even with it's limited released resulting in it's growing demand & the A certificate didn't affect at all. Ramsay brothers never looked back from here on. This was followed by Andhera (1975) and this time they even got Helen to do their film. The film due to it's low budget was again a hit. 1975 was the year where Bollywood started producing expensive films like Sholay, but Ramsay brothers struck gold the second time too. Darwaza (1978), proved to be a bigger success than their previous releases. Ramsay brothers worked with almost same set of actors, Imtiaz Khan was the lead for all the three films. Critically the movies were always targeted but the movies did end up doing more than what was expected. With Darwaza, even Anil Dhawan & Shakti Kapoor had joined the Ramsay team. This was followed by Aur Kaun? (1979) starring Sachin in the main lead. The songs sung by Lata Mangeshkar & Kishore Kumar became extremely famous among the viewers. Though the movie offered nothing new, Ramsay brothers had got their fourth consecutive hit. Guest House (1980), by now Bappi Lahiri had been consistently composing the music for Ramsay brothers films. By 1980, Ramsay brothers had become the sole rulers of horror genre despite the competition from other big budgeted multistarrers like Jaani Dushman. 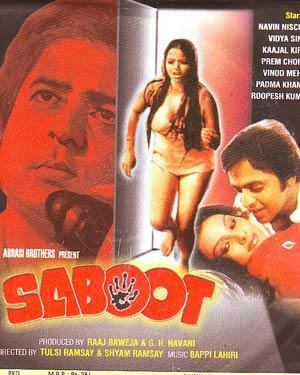 The same year they directed Saboot (1980), a horror thriller for a change. An attempt to try something different than their previous films. This film starred Navin Nischol, Vidya Sinha, Kajal Kiran & Vinod Mehra. The year 1981 saw 4 films from the Ramsay brothers - Dahshat, Sannata, Hotel and Ghunghroo Ki Awaaz. This time they even got Rekha to star in their film. Not just Bappi Lahiri, even the likes of R.D.Burman & Rajesh Roshan composed music for them. Till 1981, Ramsay brothers strictly used to work one film at a time. Dahshat even starred Sarika in the lead role. Ramsay brothers returned after 3 years with Purana Mandir (1984), making a grand comeback with a super success. It starred Mohnish Bahl, Aarti Gupta & Puneet Issar. The film joined the league of Ramsay's cult favorites. 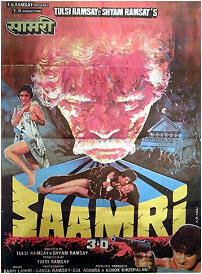 Then they also ventured into 3-D technology with Saamri (1985) & with the right amount of buzz, stars like Aarti Gupta, Gulshan Grover & then Jagdeep to entertain with his usual comic antics, the film made it to the hit list of Ramsay filmography. 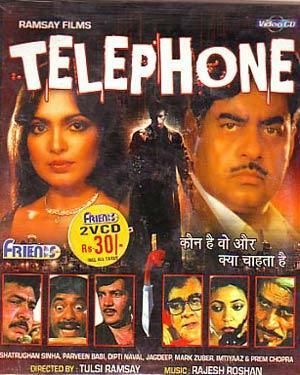 The same year they made Telephone (1985) that starred none other than Shatrughan Sinha, Parveen Babi & Deepti Naval along with Prem Chopra. This is clear example of how bigger the Ramsay films had grown to an extent of casting A-listers like Shatrughan Sinha & Parveen Babi in their film along with the talented actress Deepti Naval. Tahkhana (1986) added up to their long list of films offering nothing new but usual scares, sleaze & dated comedy. This was followed by yet another forgettable film Dak Bangla (1987) which added upto the declining market for Ramsay films. This was followed by their most famous film till date, what could be termed as a cult favorite Veerana (1988). The film had the worst possible plot, cheeky dialogues, bad camera work yet had one of the gorgeous looking actress Jasmin (wonder what happened to her?). Anyways, they repeated their success with Purani Haveli (1989) starring Deepak Parashar, Satish Shah, Amita Nangia & others. But the year ended with a failure, Shaitani Ilaaka (1989). 1990 saw the sole release Bandh Darwaza. 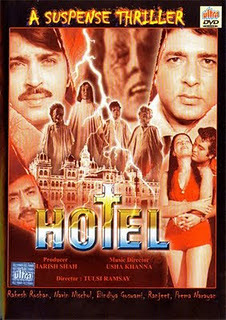 By this time Bollywood business had outgrown with the entry of the 2 Khans, movies like Mr.India & other big budget films acquiring the market leaving not much for the Ramsay type of horror genre to grow & post 1990 Ram Gopal Varma had ventured into his unique style of horror film making which completely dented Ramsay's attempt to make a comeback. In 1993 they made their last attempt through Mahakaal, a desi version of Freddie from A Nightmare on Elm Street. It starred Archana Puran Singh, Reema Lagoo, Karan Shah, Kunika, Johnny Lever, Kulbhushan Kharbanda & others. The film sank without a trace. And Mahakaal's failure was probably for good since after this Ramsay brothers ventured into small screen to give what can be termed as one of the best TV shows, The Zee Horror Show. None of the shows that have come after this have reached the level created by THE RAMSAY BROTHERS. People have always laughed at the Ramsay brothers, criticized their movies, questioned their film making but those naysayers don't realize that Ramsay brothers films has a huge cult following not just in India but in US & other countries too where their films dvd's are distributed with special edition sets. And with so much competition, the politics, the monopoly of film distribution, Ramsay Brothers ruled the horror genre for two decades starting with a movie made on just 6-7 lakhs. Here is the quote from Tulsi Ramsay that shows their true achievement of reaching out to maximum audience through B,C & D centers. They never needed to please the urban audience since no one ever pleased the B & C centers audience the way Ramsay brothers films did. Last wala quotation padh ke acha laga.. I've watched many of those Ramsay films,and yeah Veerana's jasmin was super hot,sad she did only 1 film.And Zee horror show will always be special for me,coz it gave me many sleepless nights when i was a child.In fact even its spooky music at the start with that white face gave me nightmares.When it used to start,i used to cover my ears and eyes with pillows and used to remove them by peeping towards the tv and making sure the music was over. Well done.I am fan of Ramsay's films specially Veerana and Purani Haveli. Ramsay Brothers are back with horror film Neighbours they are vampires.Watch the trailer on youtube and it will be a blockbuster.......Ha Ha. Filmmaker Tulsi Ramsay, known for horror films, passes away.